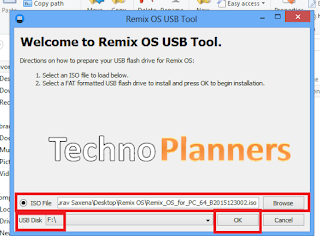 Tutorial - How to Install Remix 2.0 Operating System on your PC, notebook, Laptop with Windows. Remix OS based on Android x86 project. With Remix os you can enjoy android on your PC. In previews post We share Download Remix 2.0 OS ISO from Direct Link. Now We share this tutorial with a video tutorial. You can also check out new tutorial how to Install Remix OS on PC laptop Hard Disk with Windows Dual Boot. Minimum 8GB USB flash drive in FAT32 format. First Download Remix ISO from end of post. 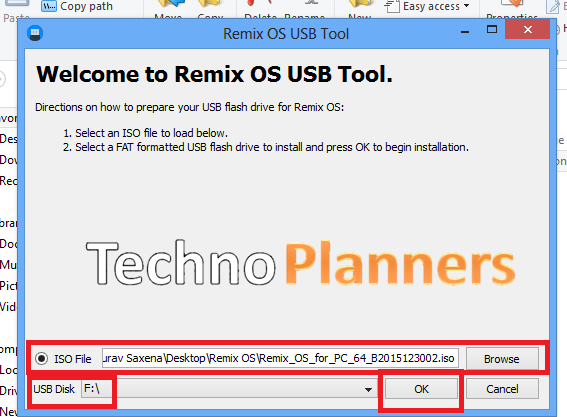 After Download you will get ISO file and Remix USB Tool in same folder. Now Connect your flash drive with your PC then Run Remix USB Tool on your PC. Click on Browser button to select remix iso file then click on OK button and wait for the process to complete. Don't remove USB flash drive after process complete. Once the bootable process complete. Reboot your PC into BIOS mode and make sure first boot priority is USB Hard disk. Now Turn on your PC using flash drive. Once your PC turn on using flash drive a blue screen will appear with dual options. In Guest mode Once you reboot you will lose all the data and installations apps from your device. In Resident mode it will save the data and System Configurations for next time and it can be take 5 - 20 minutes to install. After installation process is complete, it will ask to select the language and accept the User Agreement to run Remix OS on PC. After submit all information you can use Remix OS on your Computer by tap on start button. Share this tutorial with your friends and family. please help, are you install in which notebook ? ?